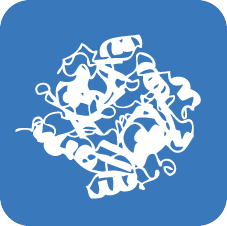 HRV 3C Protease is a recombinant cysteine protease used to remove fusion tag from proteins with the HRV 3C cleavage sequence. Human Trypsin 1, encoded by the PRSS1 gene, is also known as cationic trypsinogen. It contains a signal peptide (residues 1‑15), a pro region (residues 16‑23), and a mature chain (residues 24‑247). SUMO Protease has greater than 95% purity with no non-specific protease contamination. It recognizes the tertiary structure of SUMO and cleaves SUMO from recombinant fusion proteins. TEV (Tobacco etch virus) Protease is a highly site-specific cysteine protease that recognizes the cleavage site of Glu-Asn-Leu-Tyr-Phe-Gln-Gly and cleaves between Gln and Gly. TEV protease is a very useful reagent for cleaving fusion proteins due to its high specificity and high activity rate. MCLAB's HRC3C Protease is fused with both GST and His tags, so that the protease is easily removed form cleavage reactions by either immobilized glutathione (GSH) resin or immobilized Ni-chelating resin. Turbo HRV3C Protease is highly active at 4ºC, and also active in a variety of commonly used buffers, providing more flexibility in experimental design to keep the activity and intact structure of the target proteins. TurboTEV (Tobacco etch virus) Protease is a highly enhanced site-specific cysteine protease that recognizes the cleavage site of Glu-Asn-Leu-Tyr-Phe-Gln-Gly and cleaves between the Gln and Gly. TurboTEV protease is resistant to auto-inactivation under normal reaction conditions and works as a better catalyst than the wild-type enzyme. It is a very useful reagent for cleaving fusion proteins due to its high specificity and high activity rate without the requirements of specialized buffer.